Can Connecticut keep its fuel cell edge? 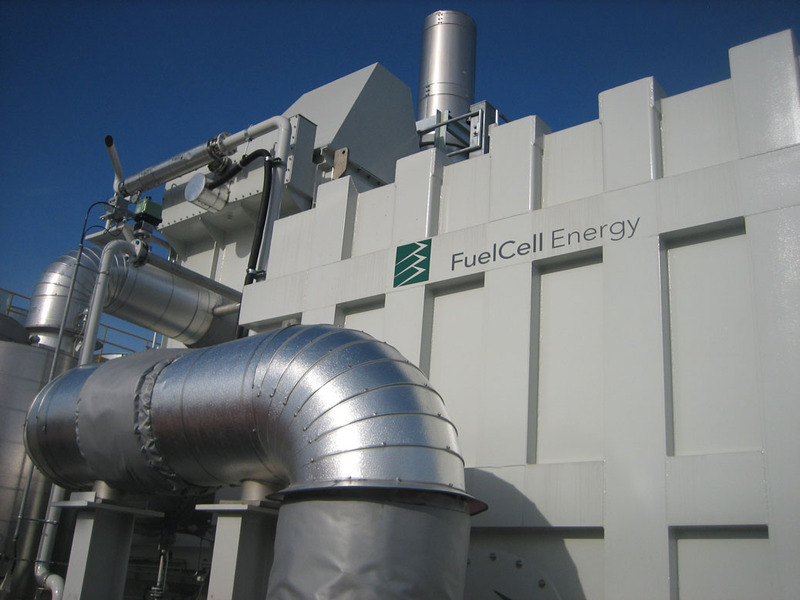 Fuel cells have been the next big thing for – well – awhile now. These just-short-of-clean-and-renewable electro-chemical energy sources that turn hydrogen and oxygen into electric power and heat, (or run motor vehicles) are an industry Connecticut has prided itself in developing, if not leading the world. But the fuel cell business in Connecticut has had its ups-and-downs, and the last year or so has been marked by extremes of each: Construction of the first-for-the-continent fuel cell power plant in Bridgeport and the bankruptcy of ClearEdge Power, one of the top fuel cell companies in the world. Both of these developments took place against the backdrop of increasing competition from other states and nations, raising the question once again whether the state still has its edge when it comes to the expanding global reach of the fuel cell business. “Absolutely yes,” said Joel Rinebold, director of energy initiatives at the Connecticut Center for Advanced Technology and one of the state’s biggest fuel cell cheerleaders. “Connecticut has an edge right now with its work force. There’s no other place in the world where you have an assemblage of such talent. As of a couple of years ago, the last data available, Connecticut’s fuel cell supply chain totaled about 600 companies, most specializing in large electricity generating fuel cells known as stationary fuel cells. Those companies account for more than 1,000 direct jobs and more than $300 million in direct revenue. But both have been flat for several years and could be poised to decline given the situation with ClearEdge. The state is also home to major fuel cell research at the University of Connecticut, though it has had a balky run in the last several years and is now in its third iteration as the Fraunhofer Center for Energy Innovation. Other states have been positioning themselves to compete with Connecticut, including Ohio, which has amassed an array of companies and research operations built on the superstructure of its automotive industry. That and other factors are cause for attention, though not alarm, say those who follow, analyze or are part of the fuel cell industry. In it’s 2014 research report on the stationary fuel cell industry released earlier this year, Navigant estimated the annual worldwide market would break $2 billion this year, twice what it was in 2012. Case in point — Proton On Site of Wallingford, a hydrogen technology company that is one of the top fuel cell technology suppliers, is for the first time considering one of the many offers it has consistently had world-wide to bring part of its operation elsewhere. “Yes definitely,” said Proton Vice President for Business Development Mark Schiller to the question of whether it’s only a matter of time before the fuel cell industry shifts somewhere other than Connecticut. But that does not guarantee success. And that lesson was driven home in spades in the ClearEdge bankruptcy which came a little over a year after it purchased United Technologies’ storied, but money-losing, fuel cell unit, UTC Power. “I did not see it coming,” said Rinebold of ClearEdge’s fall, echoing a widespread sentiment. Smith said companies have contacted her office about incentives were they to purchase ClearEdge. But despite having United Technologies’ former facilities in South Windsor, there is a possibility that whomever buys ClearEdge might move it overseas, closer to the most active fuel cell markets in Asia and Europe. Prabhakar Singh, the director of UConn’s Fraunhofer Center said he didn’t know whether the industry would stay headquartered in Connecticut, but the 100 or so researchers involved with Fraunhofer, formed less than a year ago, are involved with multiple aspects of fuel cells. “Energy is a global issue or global requirement,” he said. “Everybody needs it. Everybody needs it cheap. Everybody needs it clean. Everybody needs it now. “What we’re looking at is providing a value to the industry,” he said. Fuel Cell Energy headquartered in Danbury, powered up its first North American fuel cell power plant in Bridgeport in December 2013. But are projects like this enough to maintain Connecticut’s edge as the world’s fuel cell industry leader? The best of Connecticut’s fuel cell news came late last year when Fuel Cell Energy, headquartered in Danbury with manufacturing in Torrington and considered the premier stationary fuel cell manufacturer in the world, fired up the first fuel cell power plant in North America in Bridgeport. Its 15 megawatts – enough to power about 15,000 homes – goes directly into the electric grid. That’s unlike most electricity-generating stationary fuel cells deployed around the world today that send their power into a specific building or other facility. Fuel Cell Energy is already lined up for two similar, but smaller, fuel cell power plants in Connecticut: another one in Bridgeport and one in a yet-to-be-determined location. But its really big ones are in South Korea, where the company partners with the power company POSCO. There is promise for many more fuel cell power plants there and in Japan with both representing launching pads for the biggest potential prize – China. And the company is building a manufacturing facility in South Korea, much less expensive and more efficient than shipping from Connecticut. Another question Connecticut may need to consider is whether focusing on large stationary fuel cells may become too restrictive. On one hand, with the just-unveiled federal plan to lower power plant emissions, fuel cells may offer a solution in some of the most problematic locations. And the emergency back-up power fuel cell market may offer another avenue. Both offer potential for microgrids and to address power outages due to storms. On the other hand, there is also a federal push for more alternative fuel vehicles and that may give automotive fuel cells, something Connecticut does little with, a boost. They are used now for equipment like fork lifts and buses. But the prospect of using them in passenger cars has ebbed and flowed, with analysts for many years doubting it would happen. Fuel cell cars are being introduced on the west coast and once again are in favor. Overall fuel cells have languished behind the sexier, far cheaper solar panels and the more familiar electric and hybrid cars, leaving Connecticut to face the biggest question of all – when will fuel cells finally take off and fulfill the economic promise the state has long anticipated. “We are at the cusp of that happening now,” said Proton’s Schiller. “But it’s going to come at a different pace in different parts of the world. “Internationally it is going to come more quickly than domestically,” he said.